The three main actors involved in 15:17 to Paris deserve every ounce of attention, as well as awards. They performed selfless acts of bravery at a time when real heroes seem in short supply. Clint Eastwood is an icon. There's no debate here, his impact on Hollywood as an actor, producer, and director cannot be overstated. His last three films have been about everyday heroes that have managed extraordinary feats of courage and it seems his goal is to counteract the superhero culture prevalent in Hollywood today. I for one, am not averse to this endeavor. Many of these stories should be told, American Sniper and Sully were great stories and made for dramatic and interesting films. Unfortunately The 15:17 to Paris is, not one of those films. I would like to pause for a moment and state, plainly, that Spencer Stone, Anthony Sadler, and Alek Skarlatos are truly heroes and on that August afternoon, they selflessly diverted what may have been a horrible massacre. Their story deserved to be told but it deserved to be told by someone else. Eastwood made a tragic mistake twice during the making of this movie. He went with the convoluted and plodding script by Dorothy Blyskal and he did not hire actors to portray the heroes. The three friends are natural around each other and they do an admirable job of delivering their lines. Unfortunately, the dialog is so pedestrian, and at times, laughable that I found myself being, annoyingly, pulled from the story to wonder why Clint would have allowed some of these lines to go unchanged. For instance, at the beginning of the film, we see Spencer and Alek's mothers speak with their middle school teacher, who is trying to explain their potential ADD issues. The teacher is made to look like the enemy and when she explains the "Statistics" of children in their situation, Ms. Stone replies, heavy-handedly "My God is bigger than your statistics" before storming off, unchanged by reason. Other than the three young men, most of the rest of the cast are cardboard clichés, and they deliver dialog equally as trite and banal. It takes about 75 minutes before we get to the action on the train, but when it does, the film switched gears and portrays a gritty, realistic view of what must have actually transpired onboard. It was a taut and realistic scene and left me wanting more. The film ends with the three Americans and one Englishman (we barely understand his role in the drama) receiving High Honors from the French President. The Blu-ray is about what one would expect, shot on 2K 1080p, AVC-encoded Blu-ray, with great clarity of detail, especially when the friends are traveling throughout Europe, and I found the movie a little more interesting in the second half, due to the scenes in Germany and Amsterdam. It's obvious why Cinematographer Tom Stern (Flags of Our Fathers, Mystic River) is regarded as one of the best in the business. However, due to the almost documentary style of filming, there's little else to be wowed by. The Audio is Dolby Atmos, Dolby TrueHD 7.1 and does a decent job of rendering dialog clearly. For an action film, there's little to no intense scenes, even the attempted hijacking is understated with a few gunshots. As for the extras, there's only two of note, Making Every Second Count, a "making of" featurette which focuses on the action and challenges of filming on a moving train, and Portrait of Courage, focusing on the three friends and how they reacted to the events of that day. Although the movie was extremely generic and "by-the-numbers", the three main actors involved deserve every ounce of attention, as well as awards. They performed selfless acts of bravery at a time when real heroes seem in short supply. I just wished the movie was able to live up to the drama of the real-life event. 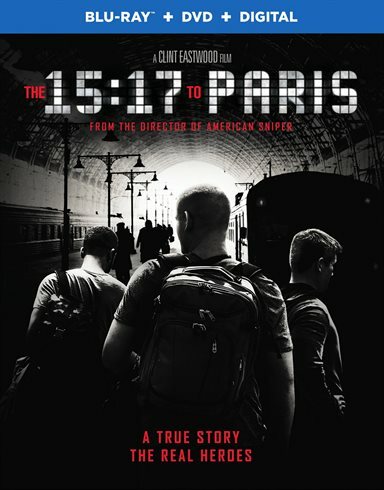 Download The 15:17 to Paris from the iTunes Store in Digial HD. For more information about The 15:17 to Paris visit the FlickDirect Movie Database.